How many people do you know at your company? The answers could range from everybody to a good few. How does the answer relate to the company size? What does that got to do with social selling? Quite a bit. LinkedIn chairman Reid Hoffman and his team at Greylock Ventures recently shared a recent presentation about scaling companies. They coined five stages of a company growth – family (few), tribe (10s), village(100s), city (1000s) and nation (10,000s). Everybody in a company knows almost everybody as companies grow to the size of a village. Beyond that, the game changes when it comes to relationship building. At heart of good sales is building meaningful relationships that culminate in deals. Using the barometer of building relationships – the rules of the game changes at the cusp of scale of growth. So, our analogy starts at a village level. A villager, let us call him John in Village A targets a buyer village (Village B). As first step, John researches the decision makers at Village B. Next, John searches his network connections to figure out who knows them well enough to make an introduction. Armed with a warm introduction, he meets the team in buyer village to understand their needs and offer solutions. 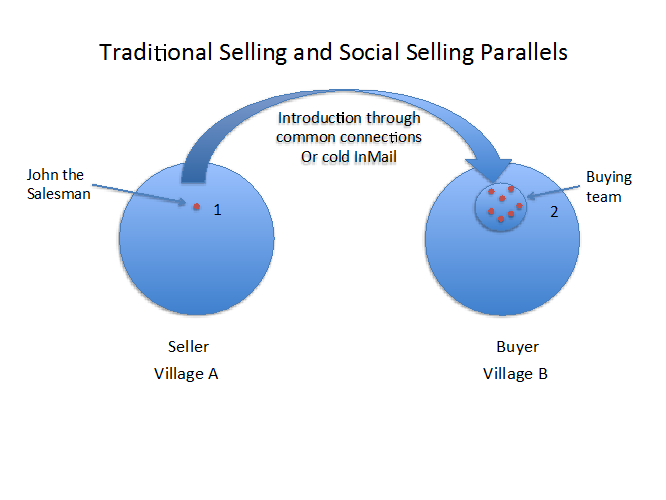 All the steps described above are the parallels between traditional selling and social selling. See diagram below. In personal life, before we decide on a school for our kids or where to buy a home - many of us research online, we also reach out to friends, family and even office colleagues for their experience. Before choosing a dentist, we try to seek out referrals. The underlying theme is to gauge our need - "who is good?" or "which schools are good?" We naturally do that before reaching the dentist or school. Juxtaposing this need idea into the social selling world, what is the best way to find possible needs before sending that first InMail. It was fairly difficult to do in the good old world of sales, so the modus operandi was to quiz the prospect on specific needs during or after the first meeting. In the social selling world, that paradigm can easily be broken. Who are the equivalent to neighbors, colleagues in the professional world before InMailing the decision makers? 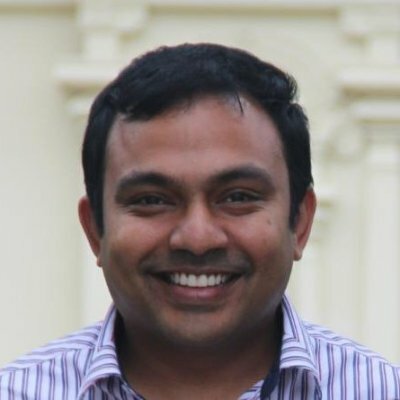 How can you leverage LinkedIn to gather the needs intelligence? Before meeting the lead team in buyer village, John can reach out to people who have left that village. He can also reach out to his counterpart sales people in the buyer village who sell other items. Why? Fellow sales people can be more empathetic and have a nose for needs. People who have left the buyer village may have a sense what are some of the needs that need to be addressed for that village. Both these sources are easy to search on LinkedIn in the social selling sphere. See diagrams below. All else equal, which InMail stands out? 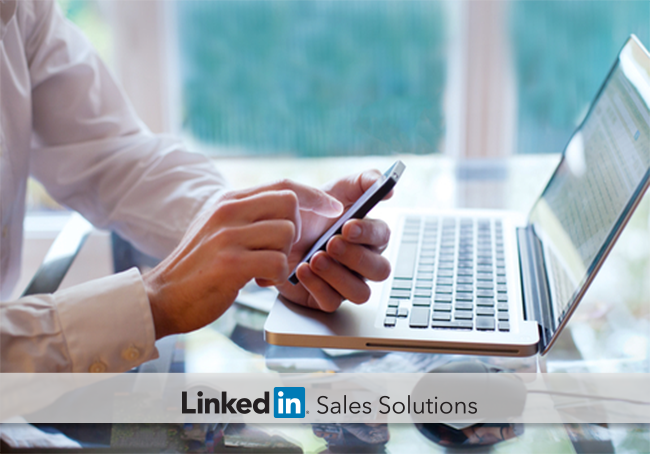 The beauty of social selling is that it brings two elements together – information and synthesis. Digital age brings us the information about the clusters of people to our fingertips. 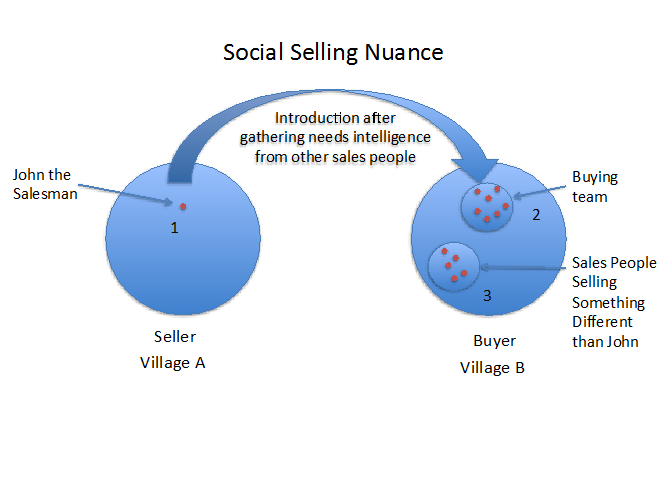 “Social” element of the social selling – the ability to reach out to former villagers and fellow sales people and seek out synthesis of needs is a worthy step to increase ROI. We can do all the online research, the fastest synthesizer is still a human brain. In traditional selling, people meet the decision makers to gauge their needs, with social selling it is possible to validate the needs when you meet the decision makers. That is small but huge difference in an introductory InMail. ROI skyrocket when you get a warm introduction and also share what some of the potential needs of that specific customer could be. It is not an educated guess but a calculated one. 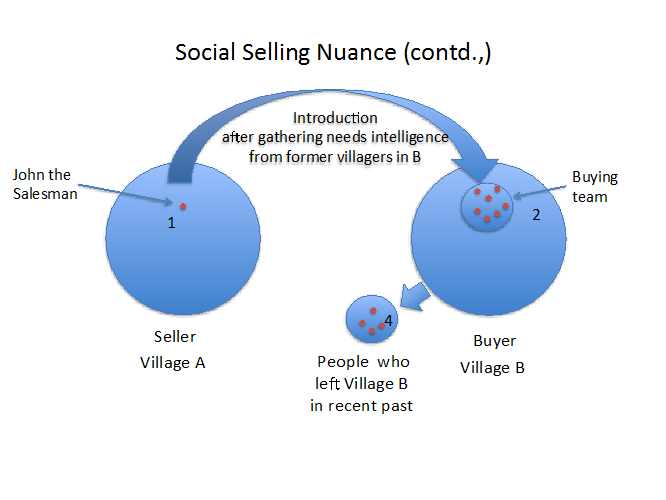 Social selling naturally enables bringing fellow sales people and former villagers within the ambit of intelligence gathering. Leverage it. Look forward to hearing your success stories as they happen. To learn more tips on increasing your InMail ROI, download our eBook "How to Maximize LinkedIn's Value with Sales Navigator."